Please click the Add to Cart button above to add this CD to the shopping cart. Then press checkout in the right hand sidebar. Delivery time: Approx. 14 days. We apologize but this item is non-returnable, as we are a social enterprise set up to spread the word about yoga’s benefits. Thank you for your understanding and we are sure that you and/or others will benefit from and enjoy using some of the CD tracks that were found to work well for those in our research trial. OVERSEAS ORDERS Please contact us, stating item(s) required and Country destination, for postage and packing rates. You will receive an email invoice (Contact the Authors page – bottom of right-hand Menu). BULK ORDERS Please Contact Us for special rates, e.g. for employee health and well-being. YHLB-Trained Teachers Please order through the [email protected] Please allow plenty of time for delivery of bulk orders. Thank you. Back pain? – Invaluable aid to learning how to relax the mind, release tension and keep stress at bay. New to yoga or relaxation techniques? – An ideal way to start at home. Already attending yoga classes? – Enjoy taking your end of class experience home. Previously attended ‘Yoga for Healthy Lower Backs’ course? – Gift for your family and friends. Yoga teacher? – You deserve to treat yourself and may also learn teaching techniques appropriate to relax mind and body for those with back problems. 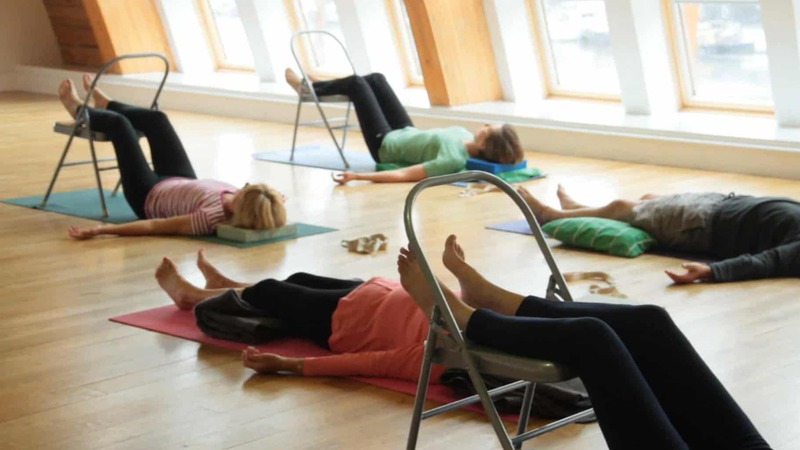 Your students will become better at Savasana and realize the potential of it by practising with this CD at home – they will enjoy your class Savasana more and yet will have the tools to continue to keep calm and tension-free at home between classes. 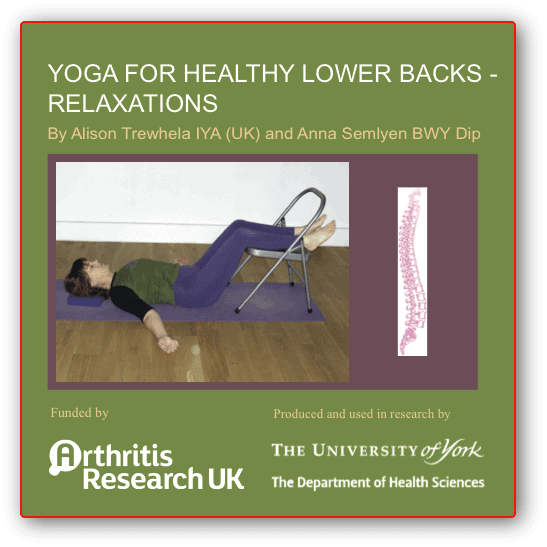 58-minute, 4-track audio album designed for and successfully used within The University of York’s 2011 research trial funded by Arthritis Research UK. Can be used as a stand-alone tension-relieving /de-stressing tool or as a guide to focus attention after a yoga practice. 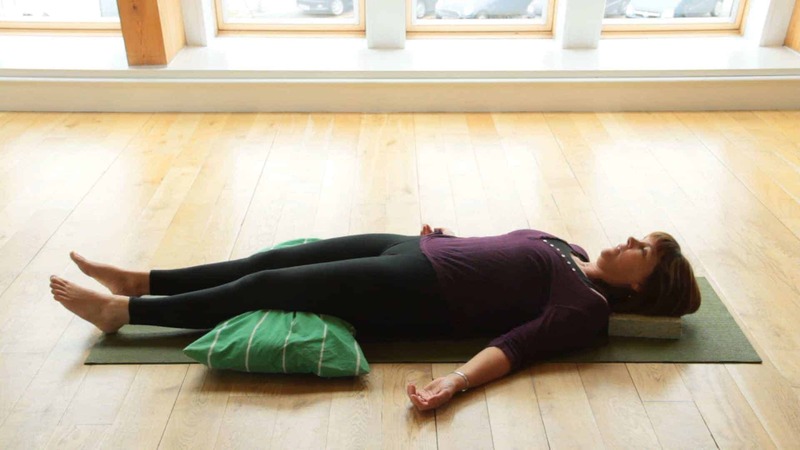 Basic Savasana for Lower Backs. –Thank You for Your Support for our social enterprise. We appreciate it. See below for the best positions for lying to listen to these yoga relaxation tracks. Absolute comfort is important, so do not remain in an uncomfortable position. The audio tracks talk you through how to get comfortable lying on your back as shown below. Please consult a yoga teacher for advice on how to get more comfortable. It is possible to listen to the tracks whilst sitting symmetrically in an arm-chair, but being horizontal is generally better. It is also possible to listen to the tracks whilst lying on a bed, but the firmness of the floor is better for alignment of the body and joints (try putting even padding underneath you, if the floor feels too hard). Exhale when you move to enter and exit the positions. 1. 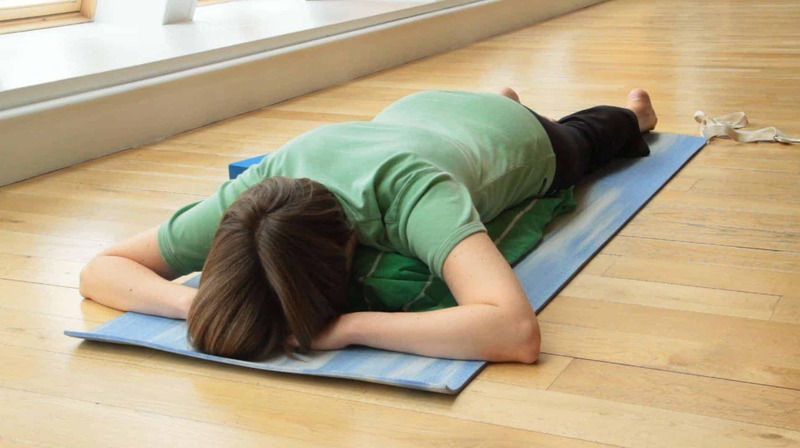 Most Useful Position for Yoga Relaxation if you suffer from lower back problems (Choose this position always unless a yoga teacher has shown you another position as below.) Lying on back; calves on a chair-seat; block/book under head. Absolute comfort. Enough flat and even padding on floor. 5. Variety of Yoga Relaxations Positions with Appropriate Props. Class situation where teacher has shown different positions for different people.